Recent analysis done by the Great Plains Institute (GPI) has found that electric vehicles in Minnesota provide a greenhouse gas (GHG) reduction of at least 61% in most cases (Xcel Energy electric mix) and 95% in many cases (for vehicle charging on renewable energy subscription programs). GPI utilized Argonne National Laboratory’s GREET Lifecycle Model, which collects the results of peer-reviewed science on GHG emissions, to calculate well-to-wheels carbon intensity under a number of automobile driving scenarios in Minnesota. The GREET model is one of the foremost authorities on the measurement of GHGs and includes exhaustive data on every aspect of energy production and use – including fuel extraction and refining, vehicle and battery manufacturing, and fuel distribution and combustion during automobile use. GPI used data on the energy landscape in Minnesota as inputs into the GREET model to calculate a more accurate picture of the GHG intensities of gasoline and electric vehicles under the most likely scenarios happening within the state. The graph above displays the results. Gasoline vehicles in Minnesota emit an average of 465 grams of GHGs per mile (g/mile) when accounting for the full fuel lifecycle, which includes energy used for fuel extraction and refining. 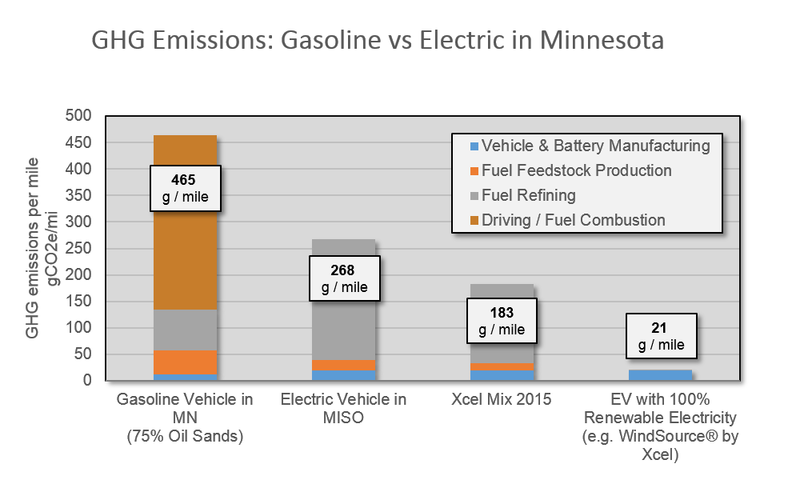 In comparison, full lifecycle accounting of an electric vehicle (EV) in Minnesota results in only 183 g/mile of GHGs on Xcel Energy’s 2015 fuel mix. It is interesting to note that because EVs have no tailpipe emissions, all emissions take place upstream, aka at the power plant and during vehicle manufacturing. And although it currently takes more energy to manufacture an electric vehicle and its battery than to build a gasoline automobile, as you can see in the above graph, the emissions from combusting gasoline vastly outweigh those from vehicle manufacturing. To calculate emissions outside of Xcel’s service territory, GPI used an average snapshot of electricity production on the Midcontinent Independent System Operator (MISO) system, which manages electric distribution across most of the Midwest. Because MISO includes many states that use a higher portion of fossil fuels than Minnesota, an EV that charges on the MISO grid would result in 268 g/mile GHGs, which still marks a 42% improvement over gasoline. Figure authored by Great Plains Institute. April, 2016. In many cases, however, EVs offer even better GHG reductions. In a 2015 survey, GPI and Drive Electric Minnesota asked Minnesota electric vehicle owners about their participation in electric utility customer programs such as Xcel Energy’s Windsource or Great River Energy’s Wellspring. These programs allow customers to to purchase renewable-sourced electricity to account for their home energy use. According to the survey, 56% of EV owners participate in these renewable energy programs, resulting in carbon-free EV battery charging. With 100% renewable energy, EVs only result in an average of 21 g/mile of GHGs, coming solely from vehicle and battery manufacturing. Source: Argonne National Laboratory; MN House Research Dept. ; Xcel Energy; MISO. Over the lifetime of each vehicle (about 160 thousand miles), a gasoline vehicle will emit about 75 tons of greenhouse gases, while most EVs in Minnesota will result in only 29 tons, and many will result in only 3.4 tons of GHGs (from vehicle manufacturing). During this analysis, GPI’s research found that gasoline that is refined in Minnesota has a higher than average carbon intensity than the rest of the US. According to a 2013 information brief by the Minnesota House of Representatives Research Department titled Minnesota’s Petroleum Infrastructure: Pipelines, Refineries, Terminals, nearly all in-state petroleum refining is done with high carbon intensity oil from Alberta oil sands and North Dakota shale oil. This results in gasoline that is almost 10% more greenhouse gas intensive than U.S. average gasoline. Source: Argonne National Lab; MN House Research Dept. In contrast, Minnesota’s electric grid has a relatively high penetration of renewable and zero carbon energy. Xcel Energy’s Upper Midwest Resource Plan 2016 – 2030, recently filed with the Minnesota Public Utilities Commission, lays out its “Preferred Plan” to increase the rate of carbon-free electricity in its service territory from 55% in 2015 to 63% in 2030. This results in an almost 20% drop in GHG intensity for electric vehicles in Xcel’s service territory by 2030. Source: Xcel Energy, 2015. Figure authored by Great Plains Institute. April, 2016. Source: Argonne National Laboratory; Xcel Energy. Argonne National Laboratory, GREET Lifecycle Model. 2015. Research Department, Minnesota House of Representatives, Information Brief: Petroleum Infrastructure: Pipelines, Refineries, Terminals. 2013. Xcel Energy, Upper Midwest Resource Plan 2016 – 2030. 2015. Midcontinent Independent System Operator (MISO). Real-Time Market Data. 2016.